Different therapies are available to address your specific health concern. 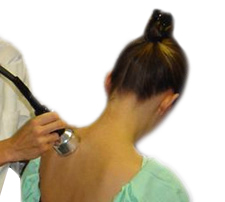 Therapeutic ultrasound is a form of deep heat therapy created by high frequency sound waves. When applied to soft tissues and joints, the sound waves are a form of micro-massage that help reduce swelling and increase blood flow. We will often us this to treat ligaments, tendons and joint capsules. By applying tiny electrical pulses to specific areas of your body, to control pain, increase blood and lymphatic circulation, reduce muscle spasm, relax or stimulate the nervous system or aid in the healing process. These special electrical signals release enkephalin and endorphin, two natural pain relievers. Diathermy, which literally means “through Heat” is a technique using high frequency energy to directly heat deep seated tissues and produce a therapeutic response. Diathermy was first used in 1907 by Nagelschmidt, a Berlin Physician. Magnatherm is useful in the management of arthritis, bursitis, low back pain and muscle spasm, tendonitis, neuritis, and other similar conditions that benefit from mild, moderate, or vigorous deep heat therapy. Magnatherm not only relieves pain but can often help resolve the underlying conditions. Paraffin wax has a very high “heat capacity,” meaning it is able to absorb and retain a great amount of heat. The bath takes advantage of paraffin’s heat-retaining capacity in a simple process called “heat transfer.” Very simply, the heat that goes into melting the paraffin is released when it solidifies into a custom-fitted, warm “glove,” thus transferring the heat deep into the affected joint or area. Using our hands, we locate areas where the resilient connective tissue of the body (fascia), have knit together in unhealthy ways, producing scaring and pressure on nerves, muscles, blood vessels and organs. A slow, gentle and sustained pressure is applied into the fascial restrictions, causing them to elongate and return to their more normal state. Often used in intervertebral disc rehabilitation, traction increases blood flow to the discs, spinal ligaments and musculature. This passive form of stretching can soften scar tissue, reduce tension to ligaments and muscles and activate acupuncture meridians on the back to help the body heal. Exercises can strengthen the muscles supporting the spine. A program of specific rehabilitation exercises will be recommended to help advance proper healing and reduce the chance of a needless relapse. Contact our Scottsdale chiropractic office now to schedule an appointment.